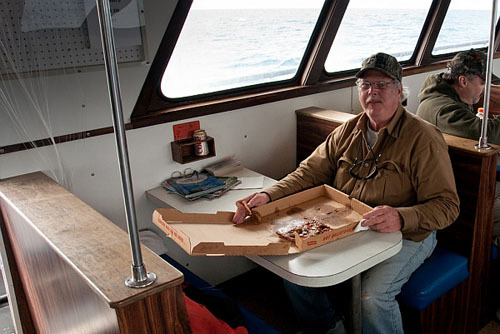 ECs NOTE: This is a recent Field Report article from our moderator Captain Bill Meyer who happened to be on board an amazing mutton marathon trip this winter. 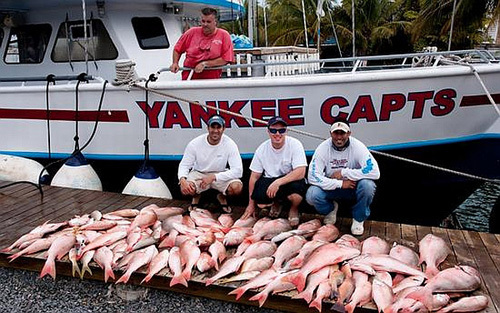 Captain Bills report and pictures should give you a pretty good idea in confirming what Captain Greg Mercurio has been telling us….it is the best fishing he has experienced in over 15 years on running these trips. 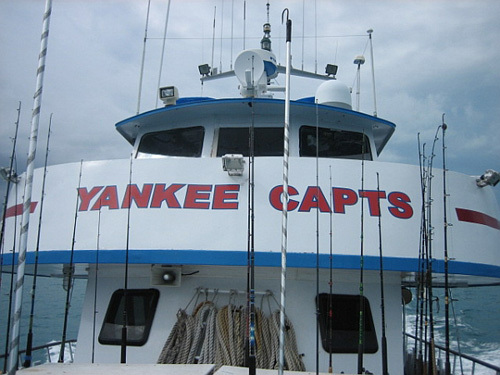 Well I finally made it down to Key West to fish the Yankee Captains. 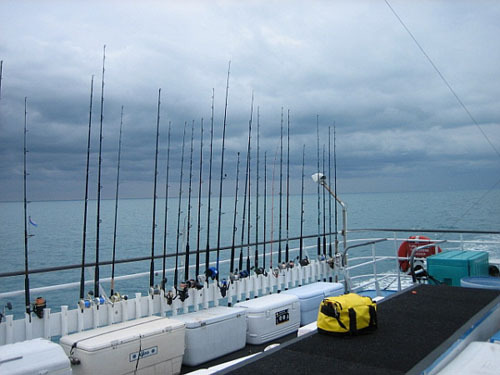 We had a great weather window with seas for most of the trip at 2-4 feet and an occasional 3-5 on one day for about 4 hours, simply put very fishable for this type of fishing. 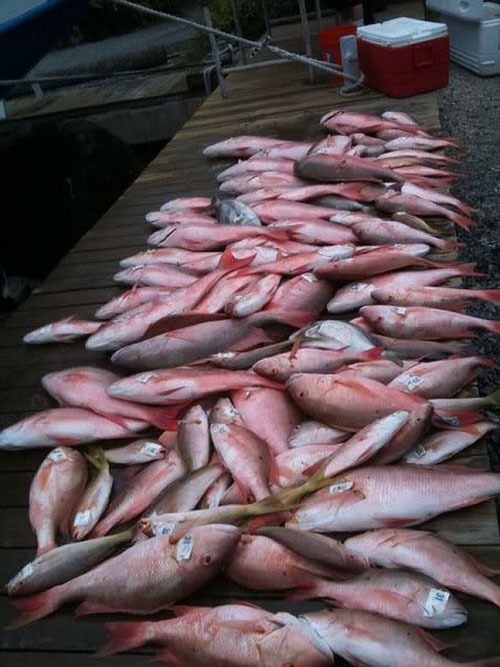 This was a LIMITED LOAD trip with about 19 anglers ranging from all over Florida. After reading about bait and tackle which in reality are the 2 most important items besides the technique and presentation I decided to leave my home at 7 AM on 2/19. 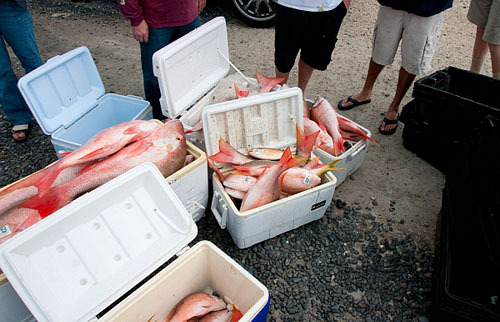 The plan was first stop for ice at the Tavernier fish house. A 100 qt and 50qt cooler were filled with cracked ice for 8 dollars. Next stop was the YELLOW BAIT HOUSE in Key Largo for fresh Bali Hoo. Both of these places are very close together. Next stop was at mile marker 88 for fresh live Goggle eyes, these do get a little pricey but fresh bait is a must. Some will say fresh frozen is just as good but I chose to go with the live ones in hopes of giving me every edge available. At the Gog stop I meet another person going on this trip named Jack who comes from New Port Richie area and has done at least 15 of these trips in the past. He asked if I was fishing the Yankee Trip and I said yes. He said follow me to NO NAME KEY to fish off the bridge for live pin fish. I followed him there got out our bait rods and picked up about 50-60 live pinfish that were also put on ice fresh. We also meet up with Marsad (charter master) and his brother who were also doing the same thing but also throwing a cast net for live Bali Hoo. 3:30 PM unload the truck and then meet Jason who also resides in Cape Coral (small world) who has more then a few of these trips. 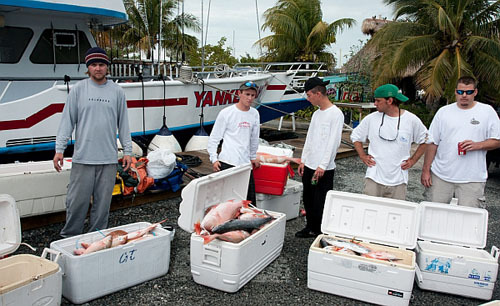 Capt Greg arrived a round 4 PM so we all got our gear on board. As the old saying goes first up is best dressed. Once everything was stored away I needed something to eat and there was a restaurant named THE HOG FISH GRILL. Hog fish is a great tasting fish and being right in a commercial port guaranteed a good if not great Hog Fish Sandwich, fried hog fish, sautéed onions and mushrooms with melted Swiss cheese on a hero with F/F Cole slaw and pickle..$9.95. It was just what I needed after a long day after getting down there. 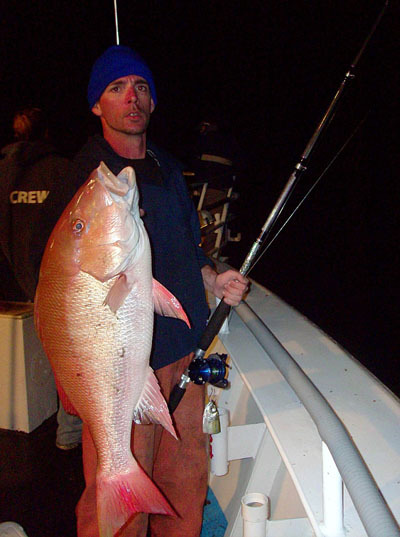 At 8 pm we left the dock and everyone started rigging there tackle, lots of Diawa 50-H, Accurate, Avets, Shimano conventional reels all high speed retrieve and few big spinners for King Mackerels. 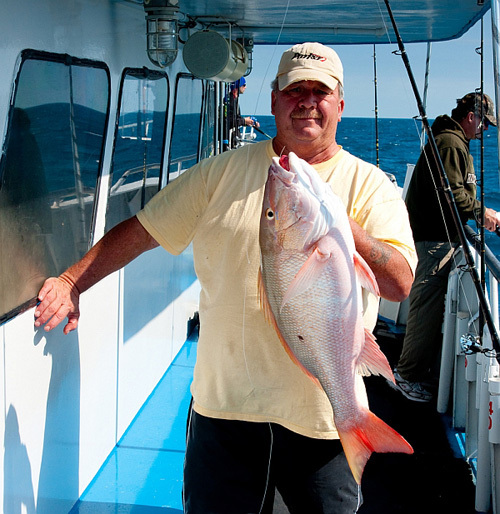 The typical rigging for Mutton Snapper is either 30 or 50 pound mono on the reel, then slide on an 6 or 8 OZ egg sinker ( we got away with 6) then a bead above tied to a barrel swivel, the to a 6 foot or longer if preferred 50 leader, believe me fluro is not needed for these trips. Hook size was a 5/0 offset Gami or any very sharp brand. Cut a Gog or Bali Hoo in ½ trimming the tail off. If using the head hook it through the lower jaw out the nose, using the tail, hook it though the tail leaving the body out to drift without causing any spinning of the bait. This is were it pays off listening to experience fisherman who were more then happy to help you out in presentation and everyone on this trip was more then willing to help out the NEWBIE (me). I was also impressed with amount of young men (young guns) that stayed at the rail non stop. These old bones need some rest between drops. The technique for this fishing is unusual for someone who has never done Muttons before. 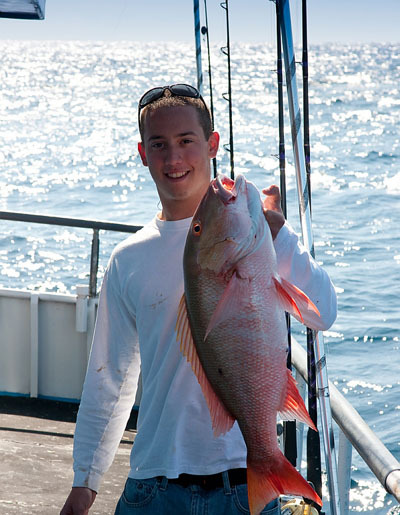 Drop your rig to the bottom and DO NOT LOCK UP THE REEL! Once on the bottom start thumbing out your line, when the boat rises let out line...DO NOT BOUNCE THE SINKER OFF THE BOTTOM. These fish a re very skid dish and even a puff of sand from bouncing the sinker will turn them off. So just pay out some line and be patient. Once you feel some light tapping keep the reel in free spool while still thumbing line out. 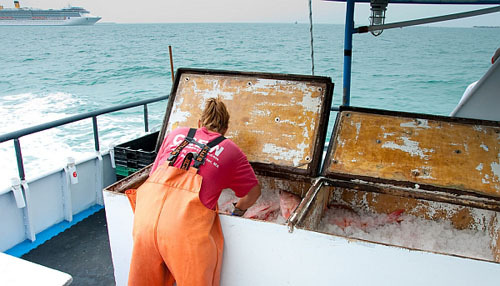 Once the fish picks it up let it run for about 5-10 seconds and lock it up. It took me a few “ANGLER ERRORS” (swing and miss) to get the feel, but once I did hook up you know you have a fish on. These fish will fight you all the way up. Thank God my first one was only in 90 feet; hooking one up in 140+ feet or better is a work out for sure. 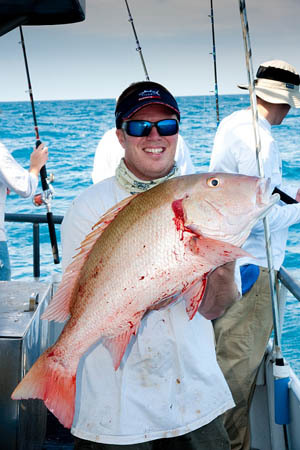 I have heard stories about big Tog, big cod, etc but there is absolutely no comparison to MUTTON SNAPPER! We also picked up some decent size King Mackerel on spinning gear. They don’t call them smokers for nothing, they run and run and run. Cant’ lock up the drag either as they have very soft but toothy mounts and it’s very easy to pull the hook. 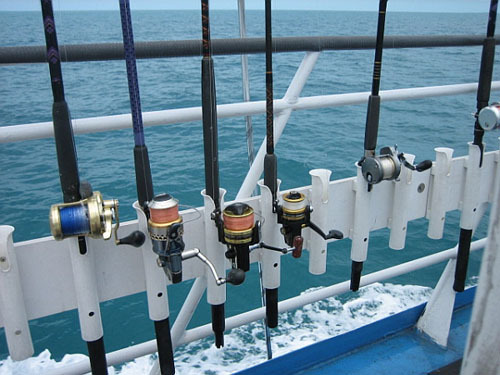 The best bite is either sunrise or sunset and that’s when all hell breaks loose, mates running all over gaffing fish, people yelling fish on, blood on the decks, everyone re-rigging because of dinged up leader. 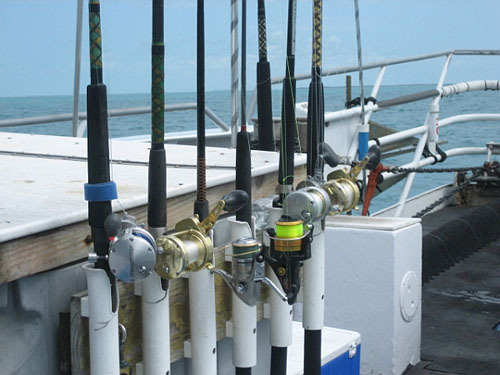 The day time bite requires some patience but if we had a drop that produced nothing or very little Capt Greg called lines up and made of move until we stared a decent pick again. 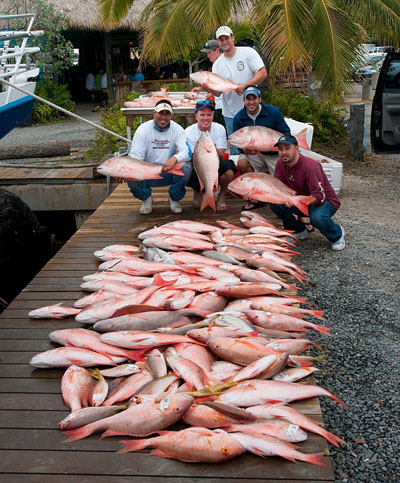 Once I saw some Yellow tail snapper coming over I changed up to a high low rig (chicken rig they call them down there) chunked up some Bali Hoo and picked away at Yellow Tail Snapper for a while, which is great table fare but 99% of these people just wanted Muttons. I forgot to mention that you are issued number tags on a piece of mono. 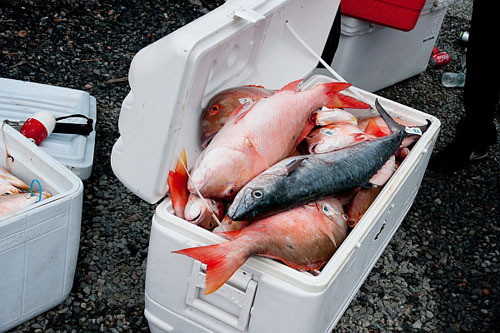 When a fish is caught them mate ask for your tag and it is stapled to the fishes gill, then into one huge cooler being iced down as the cooler fills. Back at the dock at 2:30 Sunday 2/21 and time to unload. First off is the fish. 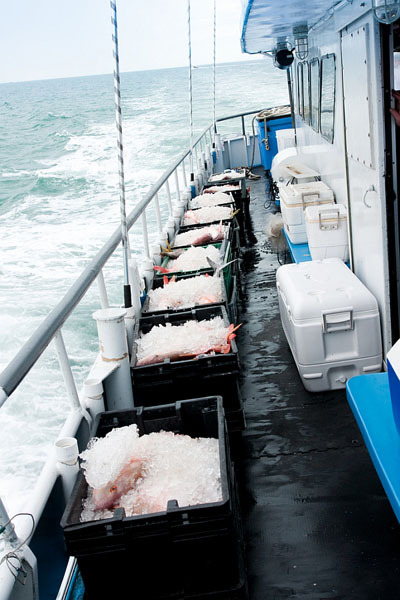 The mates drag the totes loaded with fish and ice to the parking lot, we had about 15-16 totes to unload. 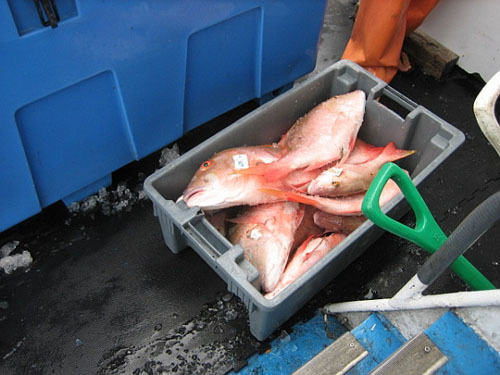 All anglers surround the mates and the totes; they pick up a fish, read the number off and then place the fish in your cooler that’s in front of you. There were plenty off 150 qt coolers loaded to the max, lots of smiling faces, crowds of people watching the unload all asking questions. The Mates did an outstanding job as expected; Ranetta in the Galley provided great food at very reasonable prices. 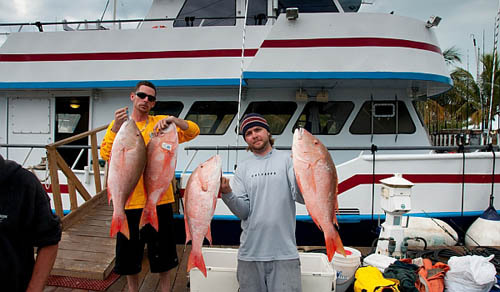 Capt Greg and Capt Matt kept us in the fish making plenty of adjustments along the way. Also at the dock was the FWC, being originally from NY I saw this and my first thought was trouble. To my surprise 2 young FWC employees dressed in jeans T-shorts that said FWC and boots. They measured fish of all size, took stomach samples and also took a piece from the head that will determine the fishes age. These men were very polite and friendly towards all. They collect SERIOUS DATA not like some places do or say they do, especially after you are used to the DEC in NY with someone in uniform and wearing a gun. Much more relaxed and informative then I thought resulting in no problems for any fisherman or the boat. I would like to personally thank Capt Greg for getting me on this trip with a group of experienced fisherman both young and old (er) as it was a learning experience for me never having targeting strictly Mutton Snapper. I am looking forward to the next time and hopefully maybe some of you Northern Boys will make the trip down to give it a shot, you won’t be disappointed.